The term portfolio is often designated towards a ‘group of investments’—and at Richmond Cycling Corps, that’s exactly how we view our operations—as a group of social investments. Cycling is the platform of our outreach, but we have assembled a cadre of other interactive methods that, collectively, ensure that we stay true to our purpose of changing the lives of youth in changing the lives of youth in Richmond's east-end. The program that started it all, Richmond Cycling Corps' began working with youth in Richmond's public housing in March of 2010. By October of 2013, our youth had ridden the equivalent of over 3.5 times around the world; 5 youth accomplished 100-miles in one day; 24 youth, many multiple times, had accomplished 50-75-miles in one day, and over 50 youth had ridden at least 25-miles in a single day. Our youth have participated in over 30-events, traveled throughout 5 states, ridden over mountains, camped under the stars, and accomplished successes on road bikes, mountain bikes, downhill bikes, and BMX bikes. Another bold move by RCC, the LAB (Learning Around Bicycles) is a one-of-a-kind, 2,000sq ft. space designated for inner-city youth to learn bicycle mechanics, a trade, a skill, and an outlet for creativity through bicycle inspired art. The RCC Youth LAB launched on December 1st of 2012-- further establishing RCC as the most successful and revolutionary cycling-based outreach program in existence. An upscale 3,000sq ft boutique for all things cycling, Richmond Bicycle Studio is owned and operated by RCC. Launched on September 17th, 2011, RBS has become Richmond Cycling Corps' primary source of financial underwriting. The 'studio' specializes in high-end solutions to bicycle sales, service, fit, and indoor cycling classes. The Armstrong Bike Park is the nation's first and only inner-city mountain bike park. Constructed on a 10 acre abandoned field next to Armstrong High School, within the public housing neighborhood of Fairfield Court, the 1.5 mile trail boasts 22 different skill-features. The park was launched as a training course for the Armstrong Cycling Team — and equally important, a point of entry into mountain biking for inner-city area youth and Richmond Public School students. In February of 2014, RCC launched the nation's first and only inner-city high school cycling team out of Armstrong High School. Refusing to become a novelty, the team trained hard, fostering solid results in their first year. In fact, the team produced two competitive Varsity athletes right out of the blocks, with four women comprising a respected JV squad. This natural progression into the high school ranks, has proven instrumental towards our youth retention — as cycling is now available as a part of their high school experience — a recognized high school sport in the prestigious National Interscholastic Cycling Association (NICA). At RCC, our youth don't just try, they create. 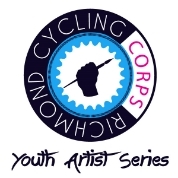 From T-shirt designs, hand-painted bicycles, to producing the official logo for a country's national cycling team (Team Rwanda), our youth create amazing bicycle-inspired-art within Youth LAB.